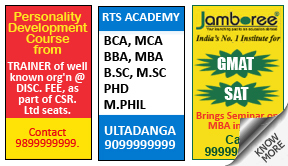 Why place Education Ad in Sikkim Express Newspaper ? A country cannot truly progress until it experiences a strong willed effort to eradicate illiteracy, together as a mass. India’s progress in developing monetary and social strongholds have coincided with a rise in literacy levels. This rise in the literacy level can be attributed to the efforts of schools and private tuitions, not to mention the numerous professors, educators and tutors. If you are looking for a platform to advertise for a school or tuition service, Sikkim Express’s Education segment is as good as it gets. Pay via credit card, debit card, cheques and a variety of other choices. • WANTED Experienced Maths and Science teachers for Class 7th to 10th for Coaching Center in HRBR Layout, Kalyan Nagar. Contact 9830629298. 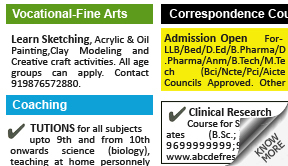 How To Book Education Ad in Sikkim Express Newspaper ? Choose which location you would like to advertise in from the list of available locations from the panel above. Compose your ad. You can seek the help the numerous sample ads that are displayed for reference in the website. Choose your advertising dates and clear payment using online or offline means. You can book your ads immediately using the instructions given above. Alternately, you can click on any of the tabs below to know more about Education Ads.